In Gaudi's work, it is suitable to appreciate his point of view as painter and sculptor. For him color was light, and whether he was using pure or iridescent shades, gold or silver, aspect and tone were just as important as the quality and durability of the pigment. All of Gaudi's designs began life as three-dimensional models in clay or plaster that allowed him to play with materials with maximum degree of creative freedom. It is basically for this reason that his furniture gives the impression that it has been made out of some wholly malleable and soft, absolutely plastic material. The absence of symmetry is a constant characteristic in Gaudi's work. As in nature, nothing in Gaudi's buildings or in his furniture is absolutely identical. When he came to design a piece of furniture he always thought about the person who was to use it and particularly about his bones, to which the form of the object had to be perfectly adapted. Gaudi designed the first set of furniture in a naturalistic style, under the new influence of Modernism whose resonance can be seen beginning to emerge in its sinuous, plant-like lines, working with forms in which it seems as if the grain of the wood has mastered the cabinetmaker. 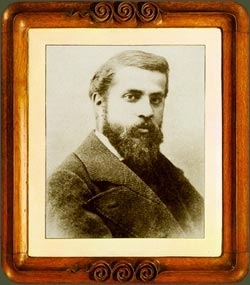 A photography of Gaudi joung in a frame designed by the architect.